Germany’s fiscal probity shines in 10 of the top spots on our annual list. The safest banks in Europe are located in Northern and Western Europe, with Germany contributing ten of the Top 50 banks and France nine. 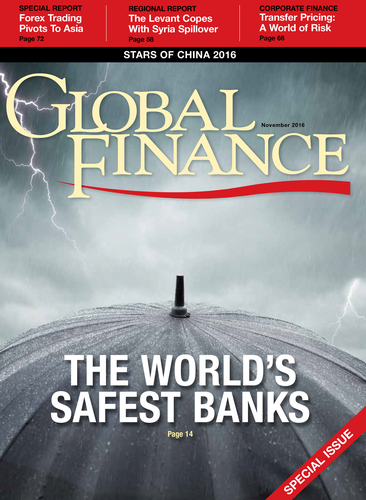 The safest nine European banks are the same nine that lead our Global Safest Banks ranking. All are state-owned or enjoy official sponsorship. Germany’s KfW heads the list, followed by Zürcher Kantonalbank and Landwirtschafliche Rentenbank. Among commercial banks—those that are less than 50%-owned by state interests—DZ tops the list, followed by Svenska Handelsbanken and Deutsche Apotheker und Ärztebank. The enduring effects of the European banking crisis can be seen in the absence from the Safest 50 of any banks from Portugal, Spain and Italy, many of which had previously enjoyed AA ratings and were among the safest in the world. Banco Santander is closest southern European bank to qualifying for the Top 50, narrowly missing out with three A- ratings. The United Kingdom contributes only five banks, but all of those are commercial banks that do not benefit from state-ownership or official sponsorship, as do many of the French and German banks. It is indicative of the changing fortunes of British banking that two of the British five are mutual building societies (one of which, Coventry Building Society has only $50.5 billion in assets), while Royal Bank of Scotland, Lloyds and Barclays fail to qualify. Lloyds comes close, however, with three A- ratings, the same as Santander. Five Dutch banks rank high enough to reach the Top 50, including the three commercial banks that dominate Dutch banking—Rabobank, ING and ABN Amro. The two state-sponsored banks, BNG and Waterschapsbank, rank near the top of the list at 5th and 6th. Scandinavia contributes 10 of the Safest 50 European banks, and half of these are Swedish. Our ranking of the Safest European banks extends to Eastern Europe and to the Balkans (though not to the countries of the former Soviet Union). Three banks from these regions score highly enough for inclusion in the Top 50, two from the Czech Republic and one from Poland (Poland’s Bank Pekao narrowly misses out).